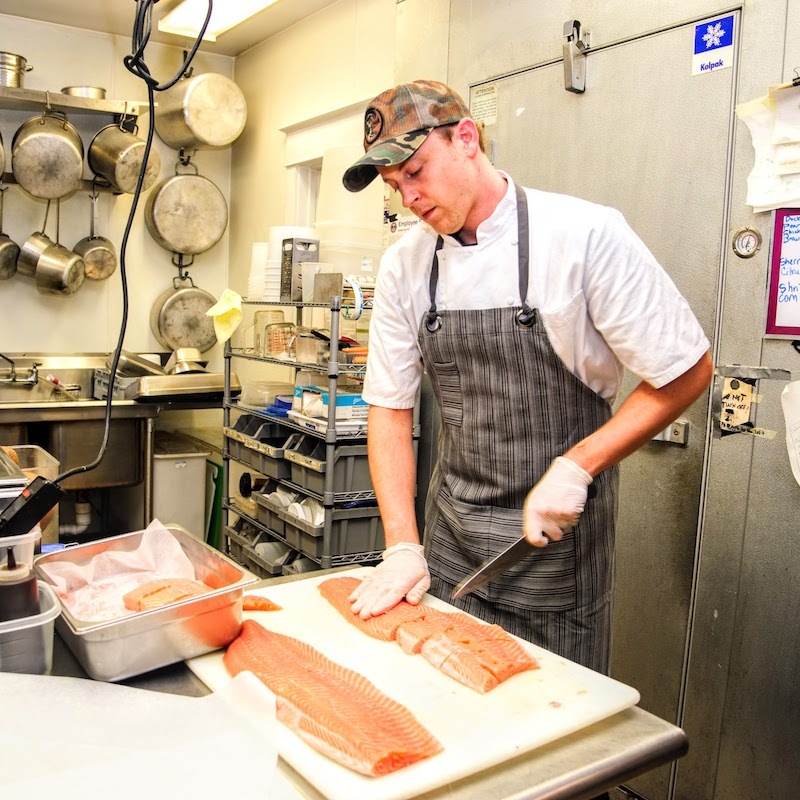 Jason Bostaph runs the tiny kitchen with precision and coordination, completely at ease filleting salmon as waiters, bussers and cooks pass within inches of one another during the post-lunch rush. The award-winning chef attributed the steady pace of the fall to the changing demographics. In the seven years since he took the job, the region’s restaurants have seen a qualitative shift. What used to be a handful of “good” restaurants at the beach has become a culinary destination, with each new restaurateur raising the bar for the last. Talented chefs and elevated expectations from area diners have made things like “locally sourced” the rule rather than the exception on the dining scene. 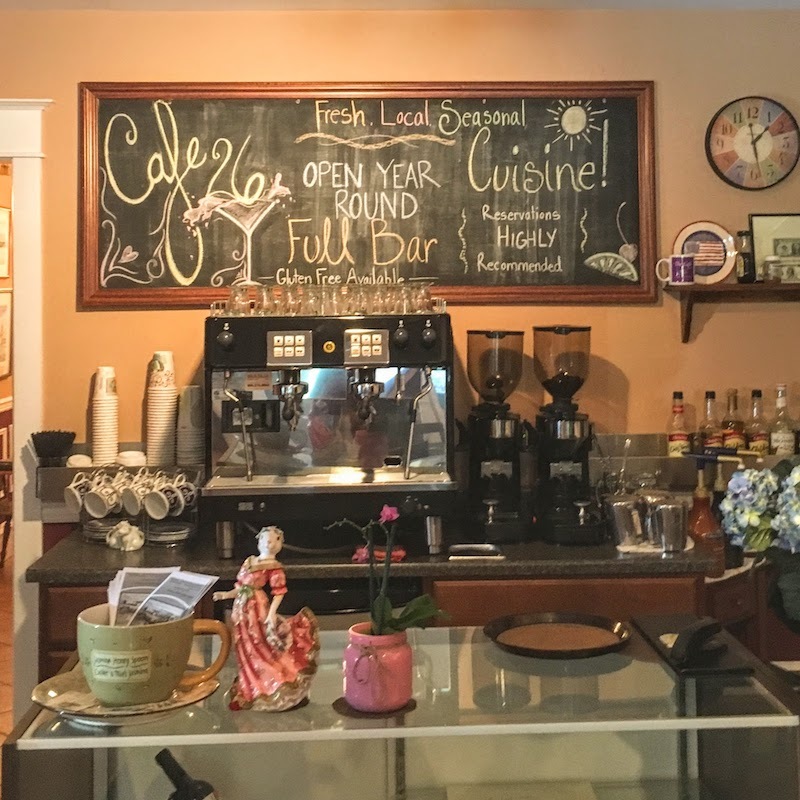 It is no surprise, then, that nearly everything on the Cafe on 26 menu is locally sourced and what isn’t is sustainably sourced. For example, one recent season, Bostaph started getting beef from Reid Angus Farm in Frankford. The switch to a local purveyor can’t help but reflect on the menu price, but it didn’t reduce demand. People are willing to pay more for better food in a way that just wasn’t the case until recently. It is part of the culinary sea change Sussex County has undergone. Chef Jason Bostaph of the Cafe on 26 in Ocean View, fillets for his signature Potato-Romano Encrusted Salmon. The rising quality of the region’s restaurants keeps every chef upping their game each season. With it, though, is an informed consumer’s palate. That’s where local chefs have a chance to shine, according to Bostaph. Over the years, Bostaph has seen successes and failures of creativity in his own kitchen and done his best to incorporate those lessons into each season’s menu. In broad terms, a menu will have beef, pork, chicken and fish. In a small restaurant the trick is to trade out variety for exclusivity. That is, there may not be 10 different chicken dishes on the menu, but the items that make it will satisfy. Or at least that is the plan. But it is that challenge to stay engaged that keeps chefs creating in an industry with an absurd burnout rate. One year, Bostaph introduced a North-African-spice, pretzel-encrusted chicken cutlet with a honey dijon sauce. So far it has gone over well, which is satisfying, but also kind of important. It isn’t just the chefs that need to be challenged. Patrons increasingly are more interested in trying something new or at least different from the old standbys. This is a more sensitive issue for restaurants that really invest in their ingredients than it is at places where deep frozen ingredients are the antidote to spoilage. Bostaph tinkered with a pork chop and apple walnut chutney combination that, he said, wasn’t bad but also wasn’t really inspiring. Diners responded unenthusiastically. As it turns out, there is no such thing as a “fancy” porkchops and applesauce. Later, he switched out the apples for a caramelized pear chutney. The earthiness that pears imply not only makes it more a fall dish, but also adds a little American exotic to an already diverse menu. As October came on, Bostaph was ready to settle into his fall menu and start to consider the winter one. Although the fall extends the season, winter in the region probably will still have a hunkering-down aspect to it, and the menu, he said, probably will reflect it. The Happy Hour Todcast: Life at the Beach is a weekly show interviewing people who make their living working at the beach. It’s a (sometimes-alcohol-infused) look at the very specific approach to the work/life balance that comes with living in a resort region. For most of the year the chef will compose nightly specials on the fly, combining the weather with his own mood and available ingredients to surprise whomever happens to come in for the evening. In the winter, though, he likes to have and also to provide a taste of stasis—a lasagne night, or maybe meatloaf—something that is technically comfort food on certain nights of the week. It’s a practice the Cafe on 26 has incorporated for years. “We like to give people something to look forward to,” he said. The Cafe on 26 has seatings from 4-9 p.m., reservations always are recommended. After all, the word’s out. A version of this story originally appeared in the Wave. 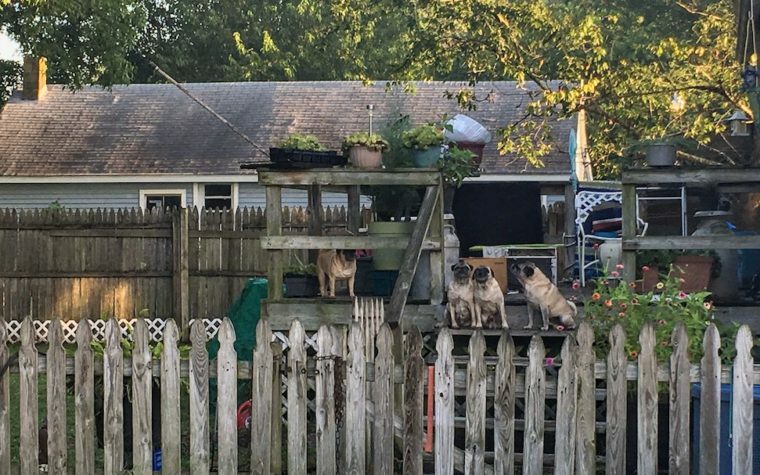 Next:When Should You Call the Cops on Your Neighbor?